Though a general election wasn’t due until 2020, Prime Minister Theresa May has called for one to take place on Thursday 8th of June. The country has scrambled to prepare for the election and campaigning is now underway. Here at Third Space Learning, we’ve scrambled to prepare some general election Maths activities. This is because we feel the general election is a fantastic opportunity to help pupils understand the mechanisms of government, as well as how voting works. What better way to show pupils how to use their power as citizens of the UK? Or improve their wider social awareness? With the activities below you can help your pupils prepare for life outside of a school, all while conducting a great Maths lesson! Print out copies of the ballot card above and give one to each of your pupils. Ask pupils to rank the four flavours in the column to the right (in ranking order best to worst with values 1-4). 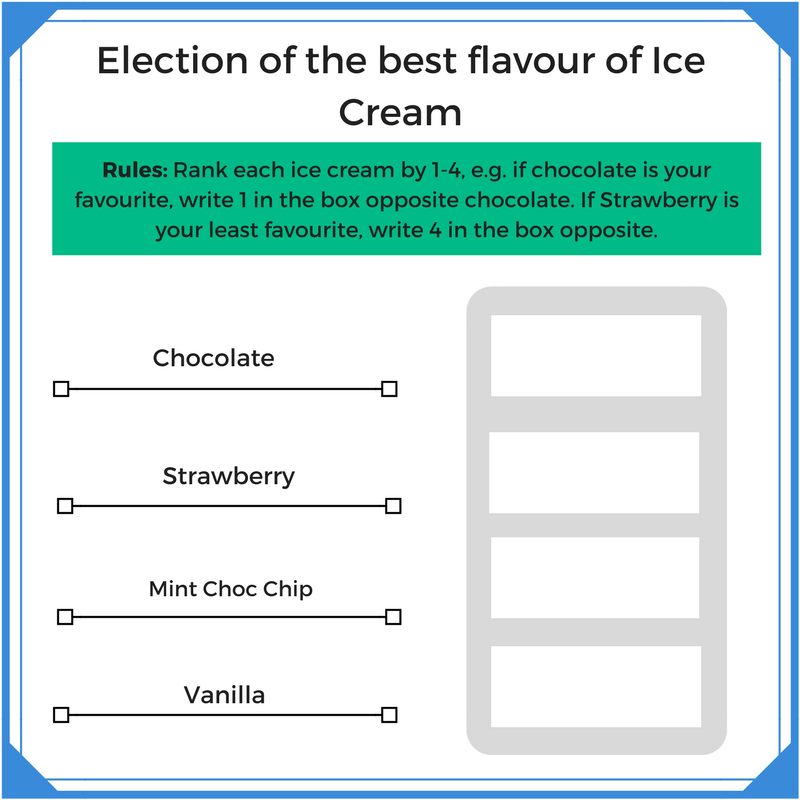 Then as a class (or group) collect them in and tally which received the most votes using the relative majority system (which ice cream had the most ones next to it). Order flavours by the number of ones. Then take the flavour with the lowest number of ones and redistribute to the other three flavours, using the twos on the ballot papers. Now do the same for the new lowest group. Stop when one flavour has more than 50% of the votes. Discuss: Did the same nominee win using both categories? If not, why? Which do you think is the fairest system? 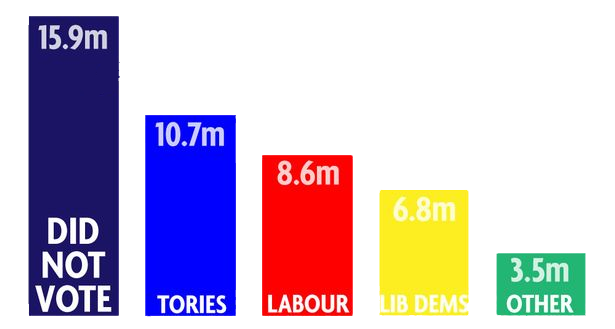 This image is of how many people voted in the 2010 general election, by political party. Use it to work out how many people voted overall. Now work out how many none voters would need to vote for the Labour Party, the Liberal Democrats, etc. to have more voters than the Conservative party. Finally, work out what fraction/percentage of people did not vote in the 2010 election. 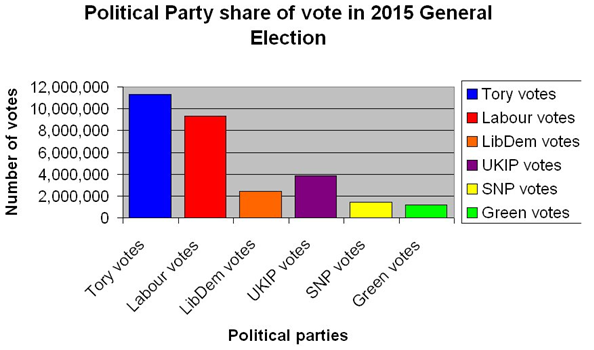 The bar graph shows the number of votes each of the main political parties received in the last general election. Estimate the number of votes received by each party. Extension: As a class, decide on the closest estimation for each party. Using those estimations, work individually to create a pie chart showing how many people voted for each political party. Good luck with the election Maths, don’t forget to tweet us @thirdspacetweet and tell us what your class or school finds our election Maths activities!